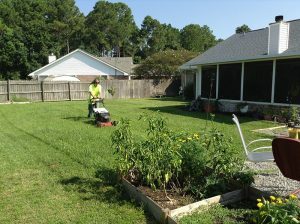 We do like to fish, barbecue, and enjoy hammock time like the masses do, but that doesn’t stop the grass from growing. So, we created R & R Services for those people who may not have the time, vision, skill, or tools to design and maintain their own landscaping. The smell of fresh cut grass is certainly intoxicating, but wrestling with lawn equipment can easily take that pleasure away. So, our goal is to make your landscape a place that you will enjoy, for we are always ready to mow your yard, install new sod, till the garden, trim the bushes, weed the flowerbeds, etc. We can even install wood fencing for your property. You’re the master of your own landscape, and you can devote as much or as little time to it as you want. You can work at your own pace and get it done eventually, or you can get done now with R & R Services. Contact Our Lawn Care Experts Today to Learn More! If you could use an extra hand with your property’s lawn and landscaping maintenance projects, we encourage you to contact us. We welcome the opportunity to earn your business. Please call today and we’ll happily provide you with a no-obligation quote. We offer everything from tree service to lawn care, stump grinding, lot clearing, and even creating rock gardens! 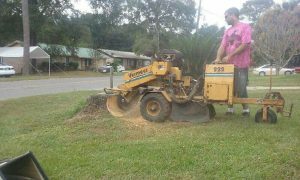 R & R Services provides stump grinding services to the Pensacola, FL area. Our professionals can show you that we will complete the job in a correct and timely manner. For more information about our stump grinding services, call us today! Call today and we’ll happily provide you with a no-obligation quote.